Ferry to Nantucket was filled to capacity. The start of the Island Cup is just minutes away as the Vineyard and Nanucket face off for football bragging rights. 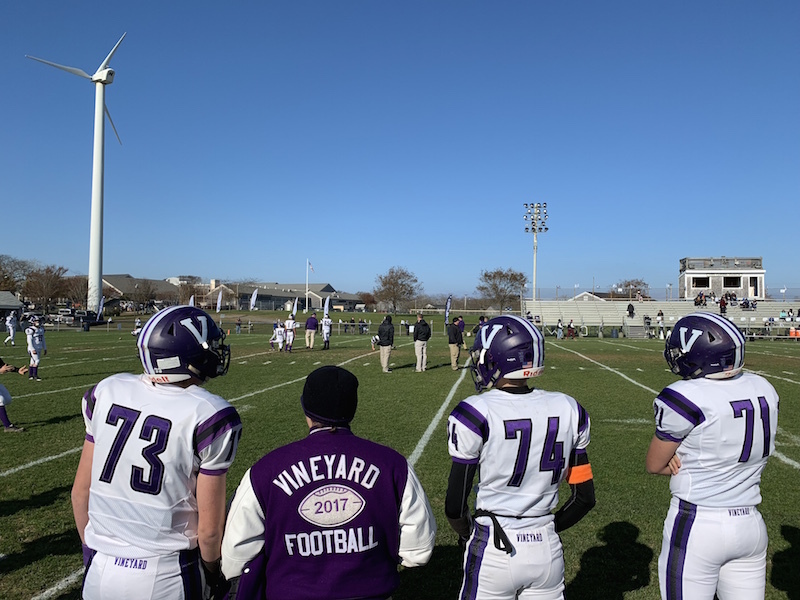 Nantucket hosts with a 6-2 record and the Vineyard takes the journey carrying a 2-8 record. The series record is 36-30-3 in Nantucket’s favor. Kickoff is at 1:30 p.m under very sunny skies. The ferry to Nantucket was sold out with 430 passengers and 48 cars. Senior Meghan Sonia was looking to help the team bring home the trophy after its stay on Nantucket the last two years. Ken Goldberg, also known as the “Voice of the Vineyard” for 38 years, sported a Martha’s Vineyard sweater knit by his mother for the first Island Cup he called in 1981. “I wear KG on the front or MV on the back depending on how well we’re doing,” he joked. The bleechers quickly filled up with students, parents and fans from both islands and the stage was officially set to continue the tradition begun in 1953.